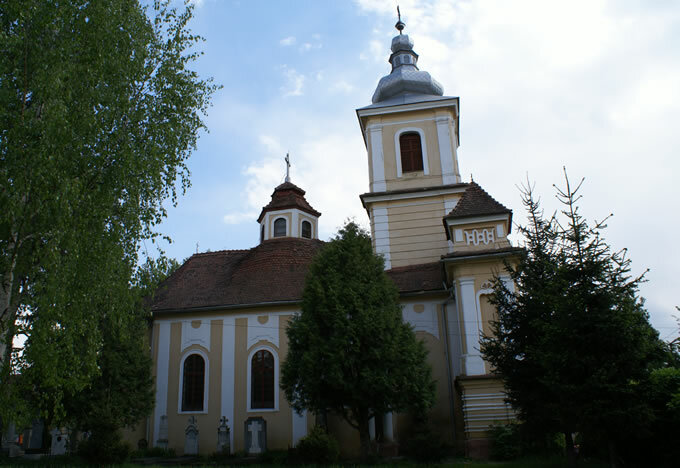 The Sibiu-Cibin Parish is located in the Lower Town and is also known under the name of "The Cibin Church". The initiative of building a Romanian church at the limit of the city to serve the Romanian population dwelling around the Cibin river belonged to bishop Inocentiu Micu Klein. He requested the Emperor and the catholic nobles from Ardeal to keep their promise made at the time of the union of the Romanian Church with Rome and give those who participated in the union the same rights as the Catholics had. After he was exiled in 1774, the issue is taken over by Bishop Grigore Maior, who succeeds in laying the foundation in 1778. That same year, a bell was donated "in the name of Valahians dwelling on Cibin", a bell that still exists today. Both the fatade and the interior include Baroque elements, massive columns, props and the motif of the Baroque golden shell. In 1992 the bishop of Ardeal, Antonie Pladeala gave the church a second dedication - "The Saint Martyrs Braovenu". In the small cemetery around the church which represents a genuine "Pantheon of Ardeal" there exist numerous tomb stones of important personalities: Iosif Sterca Suluţiu, Alex Vaida Voivod, Alexandru Papiu Ilarian, George Bariţiu, Ioan Raţiu, David baron Urs de Margine, as well as those of businessmen, lawyers, military, etc.